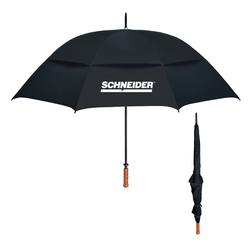 Classic umbrella design with vented windproof canopy construction. All fiberglass frame with metal shaft and blonde wood grip handle. Lightweight and less conducive to lightning. Withstands wind gusts up to 55 mph.